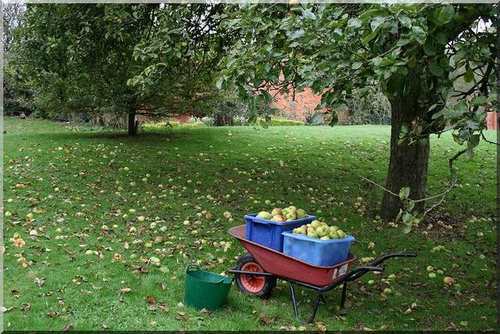 Windfall apples in a backyard orchard. Perfect for making apple cider. Small scale farming and micro farms can still produce enough food for self-sufficient living. You can be totally self-sufficient on an acre, or less. In fact, urban homesteading is becoming increasingly popular. This is the place where you are going to gain information about creating a sustainable farm on a very small piece of ground; in other words small scale farming , micro-farming or running mini-farms in order to be self-sufficient. How small? I hear some of you ask? Well, ideally, you would have 5 acres, but I will show you through the fact sheets, that I will update from time to time, that you can be totally self-sufficient on 1 acre of land . So if you have an acre or more, then you will learn that small scale farming on micro-farms is just as viable as those farms that have more land. It isn't the size of the land that counts, it is how efficiently you use the land . How many times have you passed by allotments that are packed with vegetables and fruit on quite small pieces of land, many not more than 200 sq? Which further illustrates the fact that if you want to get involved in sustainable farming, you could start in your own back yard! And many people have done just that. There is a great movement afoot in urban homesteading . See our section on Free Farm Videos to see how people are using their front and back gardens to be self-sufficient. 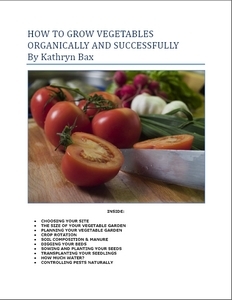 For allotment growers and for those thinking of Allotment Vegetable Growing , read allotment diaries, see some photographs, and get good advice about growing vegetables, fruits and herbs with a forum for chatting on the plot to sort out any issues. One is often asked the question, What is sustainable farming and how does it differ from commercial farming? Sustainable farming means that whatever is farmed, raised and grown on the farm is consumed by the farm dwellers themselves. They are living off the land and providing all the food they need for their own consumption. In other words, they are pretty much self-sufficient when it comes to what they eat. Therefore, you will often hear of sustainable farming and self-sufficiency farming being used inter-changeably as they are one and the same. The land size that they own, is usually, but not always fairly small, by comparison to the more commercially orientated farmers. Thus you will often hear these small farms referred to as mini farms or micro farms. Commercial farming, on the other hand, is where crops are grown and cattle is raised for others in order to make some money. Not that farming is a lucrative, get-rich business, it is not, but by being a commercial farmer one farms with the intention of having a ready-known market, the knowledge of what current prices are for their crops and animals and what niche market will bear them a profit, both now and in the future. First and foremost, as already mentioned one does not need a huge piece of land to become self-sufficient. So how small is small? Well, one can actually become self-sufficient quite happily on one acre of land . One acre of land can be used for small scale farming on mini-farms quite happily leading to self-sufficiency. However, because it is possible to practice self-sufficiency on mini farms, land management then becomes crucial. This then becomes the most important principle for sustainable farming and creating your mini farm. The clue, of course, is in the very word itself sustainable meaning to keep something going. If the land that you use to farm is mismanaged, you will never be able to sustain any crops or animals at an acceptable level of productivity. That includes both large scale and small scale farming. Mismanagement will give you the same result. What you will end up with will be both diseased and ill plants and animals and your hopes of self-sufficiency will be unfulfilled. In owning a micro farm or small scale farm, there has to be a balance between the animals and the plants because ideally you want to create a food chain where each feed each other. You need the manure from the farm animals to enrich the soil so that the soil can then produce good crops, and which in turn, will go back to feeding the animals. With small scale farming on mini-farms for sustainability there needs to be crop rotation. One cannot grow crops on the same piece of land year after year. Crops gown like this soon weaken to disease. However, the problem does not remain here, what happens is that the disease organisms that attack that plant multiply to such an extent that eventually the disease becomes uncontrollable. So plan your small farm with care, and make sure that some portion of the land is always kept fallow so that you can implement your crop rotation plan. If you are small scale farming with animals you can put them to good use by allowing them to manure your crops in a controlled way. Animals need feeding so why not allow them into your crops but have them within an enclosed area? That way they are being fed, and at the same time fertilizing the land at the same time. Keeping chickens works very well. Not only do they fertilize the soil, but they also eat the insects that may be destroying your crops. Look at the land resources that you have for small scale farming and see how you can improve or utilize them. Do you have enough water on the property? If not, should you build a dam and if so, where would be the best place to put it? Irrigation is important and you cannot rely on the weather these days. Look too at where your prevailing winds are coming from and plant trees here to create a protective barrier for your crops. Replanting hedgerows is a must for those of you who are interested in organic farming and preserving nature. Many overzealous farmers ripped out kilometers of natural hedgerows in the 80s and 90s in England. After such a thoughtless decision of the consequences, what they subsequently discovered that hedgerows have many benefits. Not only have they helped stabilize the soil and prevent soil-erosion, they are also a benefit to controlling insects and pests. These hedges are a natural habitat for many of England's birds, insects and mammals and which had created the very eco-system that had silently been highly beneficial to farmers who had had them. Many of the birds, for example, had fed on the very insects that, after the hedgerow destruction, were spreading in large numbers, as the birds were no longer there to keep them in control. As a result many farmers have now reverted to replanting the hedges. The inclusion of this example illustrates that as custodians of our planet, as farmers, we should take grave deliberation of any changes we make to the land and ask ourselves whether what we have planed to do will be harmful in any way. We should be encouraging the right types of animals and insects to your garden. Details of this topic can be found in the back issue of our April, 2009 e-zine. Finally, there is the old adage, Waste not, want not. In sustainable farming and as mini farm owners the key is not to waste. Do not waste the natural resources that you have. Do not waste the opportunity to re-cycle everything. Take your vegetable scraps and either start a compost bin with worms for vermicompost or start an open compost heap. When you have pruned your trees and have grass clippings after mowing the lawn, add these to your compost. When you have animal manure, add that too, along with any animal residues after slaughter or crop residues after harvests. Waste nothing! The land can support you, even if you own a small scale farm, as long you if you treat it well. Here is a book that many of you have been waiting for - an in depth guide to being self-sufficient on a 1/4 of an acre. This is a beginners guide with step-by-step instructions on how to become self-sufficient with many photographs showing you just how. There is advice on chickens, seeds, growing vegetables, preserving food, recipes... the list goes on. This is a must-have book for those who are serious about turning their lawns into lunch! For more information on being self sufficient, visit our Self Reliance section. Visit our Country Corner Store for online shopping for books and merchandise for small scale farming, farming equipment and seeds. If you are looking for more information on self-sufficiency and especially organic farming then go to Organic Gardening and Homesteading. Learn about goat and chicken raising, frugal living and general homestead living. Here is a very interesting video on the uncertainty of a regular oil supply, how farmers are being squeezed from every side, and yet how we can rise above this by being self-sufficient on a very small piece of land. See how 2 families have made a success at self-sufficient farming. Self Sufficient Farm Living is about learning and enjoying American Traditional Skills and Crafts. There is nothing like the feeling of self sufficient living. Why pay the high prices of today's economy when you can make or build it yourself. Learn and Enjoy American Traditional Skills and Crafts. You can Add your Own Comments and Pages on Small Scale Farming! We have lots of pages where you can contribute to throughout this website. We love hearing from our readers, and hope you will be one of those we hear from too. Feel free to add your own information or experience in homesteading on a mini-farm or small scale farming.